No paper? No problem! 60" and 72" width desktops are the most popular, but the bigger your top, the more you can draw or write! Standard V2 frames work for most, but for ANSI/BIFMA compliance, our commercial V2 frame adjusts 2" lower to suit users from 5'0" to 6'3". The Whiteboard Sit-Stand Desk is available in a variety of lengths. Each desktop is 30" deep, to provide ample space for your desktop accessories or whiteboard musings. Desktop widths range from 48" wide up to 80" wide. The rectangular desktop features 30 mm rounded edges, so you won't run into any sharp corners while doodling the day away. When it comes to exploring your imagination, the sky's the limit with the UPLIFT V2 Whiteboard Standing Desk. Doodle, draw, and make daily notes—right on your desktop. This is a sit-stand desk that's designed to foster your creativity, allowing you to capture ideas without stopping to open an app or hunt down pen and paper. We paired our GREENGUARD-certified laminate whiteboard desktop with the UPLIFT V2 Frame—the exact frame from Wirecutter's pick for "Best Standing Desk." Its refreshed design is packed with new features and a patent-pending mounting system, found exclusively in our desks. The end result is a more stable workspace that's endlessly adaptable and boosts your creativity in the office. Whether you choose the UPLIFT V2 Frame or the UPLIFT V2 Commercial Frame, you're getting the most advanced sit-stand desk available. Click here to learn more about (and compare) the UPLIFT V2 Frame and the UPLIFT V2 Commercial Frame. Made from eco-friendly laminate materials and styled after the classic whiteboard you're probably used to seeing in meeting rooms and conference areas, our whiteboard top takes the concept of a blank slate and turns it on its side, literally. Use this innovative desktop surface as a notepad. Draw, record memos, and create erasable calendars—all on your desktop. Our whiteboard top is GREENGUARD certified; held to rigorous standards, this desktop is made from sustainable materials and sealed with air-safe finishes, to help preserve your indoor air quality as you work. Your new desk even comes with a set of four whiteboard markers and an eraser to get you started. Looking for another laminate option, or maybe even eco or wood? The UPLIFT V2 Standing Desk is available in a growing number of finishes. For even more information, check out our comprehensive Desktop Brochure. Which Frame Should You Pick: The UPLIFT V2 or UPLIFT V2 Commercial? The UPLIFT V2 Frame has a height adjustment range of 25.5" - 51.1" (with a 1" desktop installed). This popular frame is remarkably sturdy, quiet, and advanced. It also supports the desk that was selected as the "Best Standing Desk" by Wirecutter! The UPLIFT V2 Commercial Frame has a height adjustment range of 22.6" - 48.7" (with a 1" desktop installed). This frame has a lower starting height, a lower max height, and a larger overall height-adjustment range compared to the UPLIFT V2 Frame. It meets ANSI/BIFMA durability standards, in addition to the ANSI/BIFMA G1-2013 height standard, which is required by many of the world's largest companies. The UPLIFT V2 Commercial Frame supports ergonomic working postures for 5th percentile females through 95th percentile males, in seated and standing positions. Click here to learn more about the differences between the UPLIFT V2 Frame and the UPLIFT V2 Commercial Frame. Your UPLIFT V2 Frame comes with something exclusive to our desks—four dozen independent, patent-pending mounting points, which let you work in a whole new set of ways. Imagine being able to take an afternoon power nap at the office. Well, now you can! Install our growing collection of desk accessories directly to your desk frame; all holes are built discreetly into the frame, hiding under the desktop for a clean, organized look. We have many frame attachments planned for release, including desk extensions, power strips, and CPU holders—we even offer an under-desk hammock (available now). Please note: the hammock is only compatible with the UPLIFT V2 Frame. It's not compatible with the UPLIFT V2 Commercial Frame because it interferes with the stability crossbar. Add the Advanced Keypad to your setup, and enjoy one-touch adjustments on four programmable memory buttons, which allow you to transition to your perfect sitting and standing positions quickly and easily. Just press a button when you're ready to switch postures; your desk will adjust, giving you the perfect amount of time to move your chair. Anti-collision sensitivity and a keypad child lock both boost your desk's safety. Work knowing your desk will only adjust when you want it to—and if it does come into contact with objects or people, it's smart enough to know to stop. The desk's maximum and minimum heights are also adjustable. Set the upper and lower height limits to prevent your desktop from knocking into shelves above or file cabinets below. Lastly, an auto-dark LED display dims 10 seconds after you use it, to help you maintain focus in the office and reduce distractions. From the bottom of our hearts, we want to tell you, our customer, thank you for the support you've given us over the years. We created UPLIFT Desk after listening to you; it's been our goal since the beginning to help every person and every office build the spaces that let them do their best work. We're dedicated to keeping our prices as low as possible, while holding our quality to the highest standards, so that you can create a long-lasting workstation that helps you work better. We're honored to be named the "Best Standing Desk" by Wirecutter and now Forbes, and also to be rated #1 by Wired, Lifehacker, and many others. Join the hundreds of thousands of happy customers, including hundreds of Fortune 500 companies. Give yourself plenty of power for your desk and your devices with our growing collection of power options. From on-desk power grommets to surge protectors to clamp-on power units—we have all of the necessary accessories to help you stay plugged-in and perfectly powered at all times. It can happen to the best of us. You're set at your new workstation and everything is looking great...until you look underneath. If you spot dangling cords or surge protectors without a proper home, it's time for some wire management. Let us help you furnish your workstation with the right solutions. We offer more wire management options than anyone else in the industry, enabling you to sit and stand at your desk with cords that are well protected and safe from snagging or being pulled out of the wall. Your UPLIFT V2 Whiteboard Standing Desk even comes with a wire management tray to get you started. If you're putting together an office of four or more desks, we'd like to help you turn your dreams into reality by offering you our complimentary space planning services. To get a custom layout, all you have to do is complete four simple steps; we'll configure your office desk space for free, no strings attached. With your layout, you'll also receive a discounted quote for your order, making your dreams even more affordable to achieve. What is this laminate made out of? Our Whiteboard laminate is composed of thermally-fused melamine laminate over 45 lb density E-1 rated particle board core, and comes with a 3 mm PCV edge banding. This high pressure treatment makes for a durable surface that's perfect for writing and doodling. 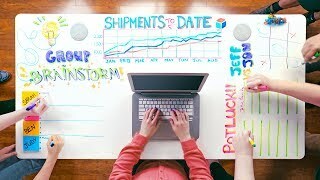 Is the whiteboard desktop "soft"? Is it hard to take care of? Our whiteboard laminate desktop is not soft, but is harder than most other laminate desktops. In other words, you can write on this desktop with no issues or indentations thanks to the melamine top coating that protects it. To safeguard your whiteboard desktop from damage, we do not recommend using it in wet or humid environments, as this can damage the desk. It is also advised that it be kept out of direct sunlight. Does the whiteboard desk come with the marker and eraser? Yes, your UPLIFT V2 Whiteboard Standing Desk will come with four whiteboard markers and one eraser. How easy is it to clean this whiteboard desk? You'll love the whiteboard laminate desktop because it is one of the easiest desktop surfaces to wipe clean! Simply use a dry erase board eraser to erase your markings, and if you want to disinfect your desk, soapy water or Lysol wipes do the trick. I think I need additional cleaning. What should I do? When additional cleaning is deemed necessary, a soft cloth dampened with warm tap water and mild soaps, like regular hand or dish soap, are recommended. If you have persistent stains, your Whiteboard Desktop can be cleaned with household glass cleaners. We advise using 409® Formula All-Purpose Cleaner, Mr.Clean, Fantastik, Windex, Isopropyl Alcohol, or Zep Write-Away Graffiti & Ink Remover. If you still have marks that need to be removed, simply treat with a short 2-minute exposure to hypochlorite bleach, such as Clorox, immediately followed by a wipe down with clean water and a soft rag. We do not advise using bleach on your desktop longer than 2 minutes as this can cause permanent discoloration. Why doesn't this look like your other laminate desktops? If you're looking for an eco-friendly and affordable desktop, laminate is for you. These tops come in a variety of finishes, including more traditional wood finishes that you might have seen before. Whiteboard is made with a similar process to the process of our other laminates, but instead of sealing it in a wood finish, it's topped with a whiteboard material, which allows you to write on it with dry erase markers. If you're looking for more of a classic look, we do have a large collection of laminate options - shop our laminate desks here! How durable and strong is this desk? We design all of our desktops to be strong and long lasting. Laminate is a remarkably durable surface and suits most users, but if you have any questions, you can give our support team a call and we can answer any additional questions you might have.